Newport midfielder Mark Byrne was a transfer target for Gillingham before a U-turn from manager Justin Edinburgh. 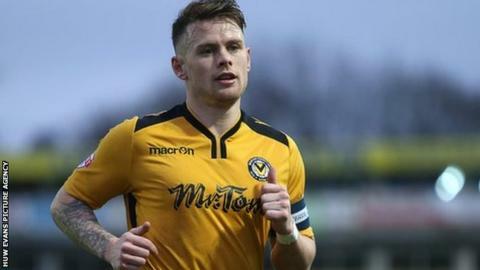 BBC Wales Sport understands the Gills made an enquiry for Byrne, before Edinburgh changed his mind over a player he brought to Rodney Parade. Edinburgh opted to end the pursuit out of respect for his old club, who he managed from 2011-2015, so as not to weaken their battle against relegation. They are currently 20th in League Two, seven points above the relegation zone. Meanwhile, Newport have confirmed the release of defender Matt Taylor. The 34-year old joined from Cheltenham in the summer but made just five appearances for the south Wales club. "Further to recent discussions, we can confirm that Matt Taylor will leave the Club with immediate effect having mutually agreed to terminate his contract," a statement from the club read. Taylor is understood to be a target for Torquay United.